The holidays are such a fun time for crafty and artsy people. There’s just so much decorating and festivity going around which means there are plenty of opportunities for you to get your glue guns out and create something beautiful! If you’re looking to get crafty this holiday season, then you’re going to love this article! We’ve got 20 Adorable Handmade Christmas Ornaments for you to try your hand at! These DIY Christmas Ornaments are so fun and easy to do, and they will definitely make your Christmas tree unique and interesting. Gather your materials, invite your friends and family over, and make a fun day out of making your own ornaments! There are so many creative ornament ideas out there. The ones we feature here use everything from melted crayons and wires to candy canes and beads. 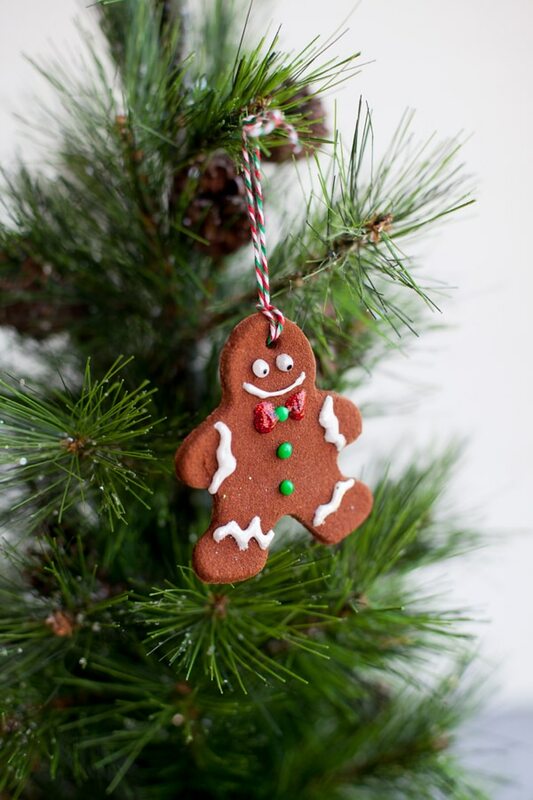 Ready to make your own homemade ornaments? Let’s get started! Handmade Christmas Ornament Idea #1: Want DIY Christmas tree ornaments that can also double as yummy treats or party favors? 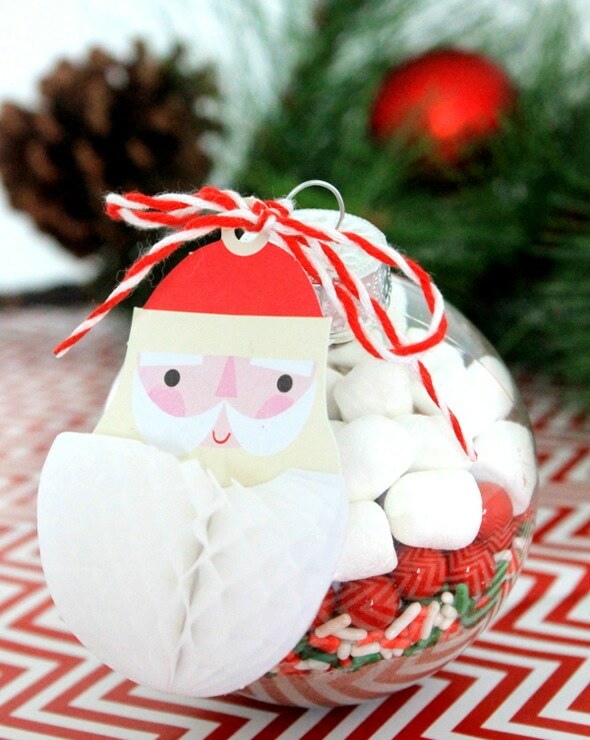 These Santa Hot Chocolate DIY Christmas Ornaments are perfect for you! These handmade ornaments are quite easy to make, so rope in the kids and have some fun making them! Handmade Christmas Ornament Idea #3: Wow! These Woodland Animal DIY Ornaments are definitely one of the most beautiful homemade Christmas ornament ideas we’ve seen. It’s not as simple as the other Christmas ornament crafts here, but the end result is definitely worth your time and effort! 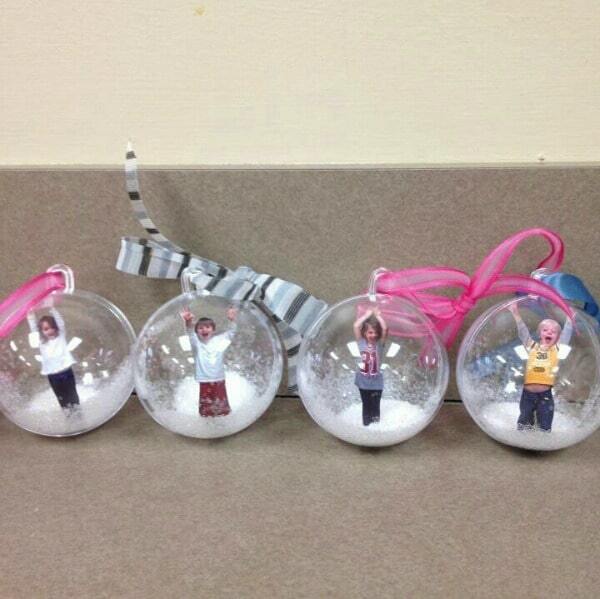 Handmade Christmas Ornament Idea #4: You can’t get more personalized than these amazing Photo Snow Globe DIY Ornaments! It will be a fun experience to take cute photos of the kids and other family members so you can make your own Christmas ornaments. 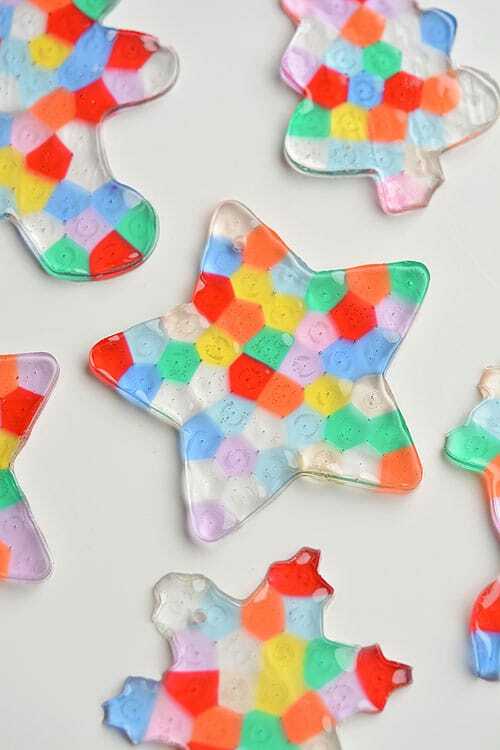 Handmade Christmas Ornament Idea #5: Here’s another great idea for yummy and easy Christmas ornaments to make. 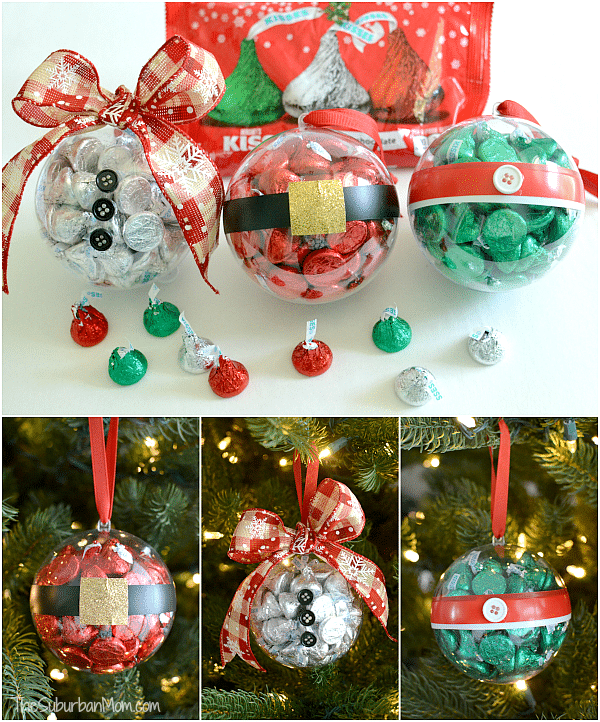 The kids will absolutely go crazy over these Hershey Kiss DIY Ornaments! 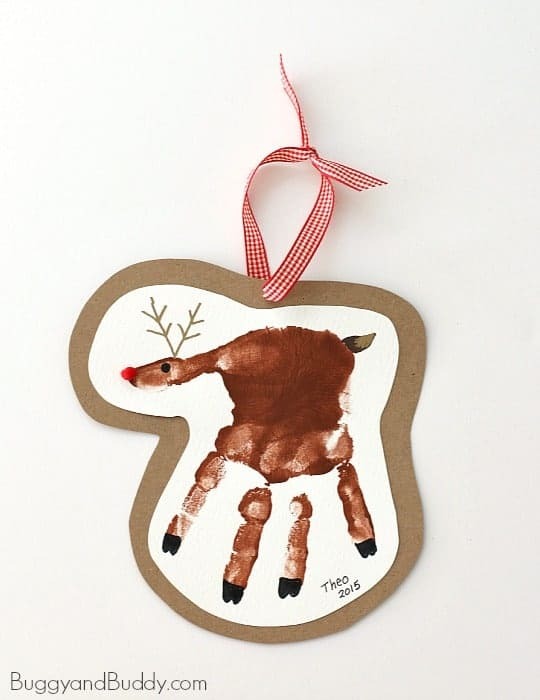 Handmade Christmas Ornament Idea #6: These Reindeer Handprint Homemade Christmas Ornaments are so adorable! These homemade Christmas ornaments are super easy to make, and crafting these will be a great time to spend with your kids. Handmade Christmas Ornament Idea #7: How creative are these handmade Christmas ornaments? 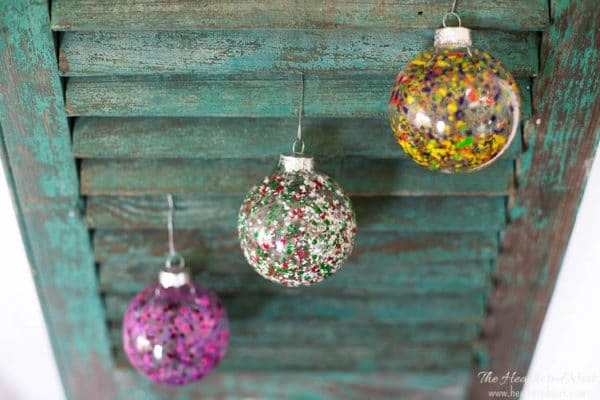 If you’ve got a lot of broken or rejected crayons lying around, these Melted Crayon Homemade Ornaments will be a great way to use them all up. Handmade Christmas Ornament Idea #8: Wondering how to make ornaments without spending a lot? 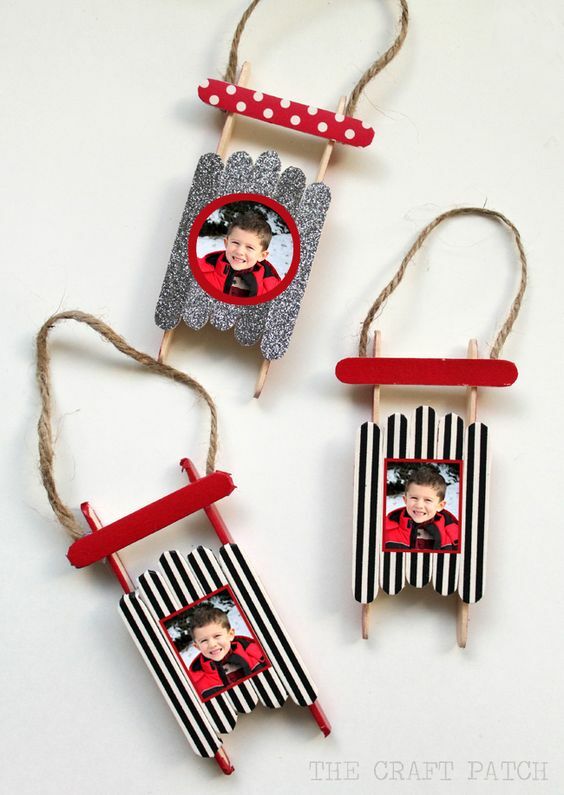 Using simple, easy-to-get materials like washi tapes and popsicle sticks, you can also make amazingly easy Christmas ornaments like thesePopsicle Stick Sled Homemade Christmas Ornaments! Handmade Christmas Ornament Idea #9: Gorgeous! 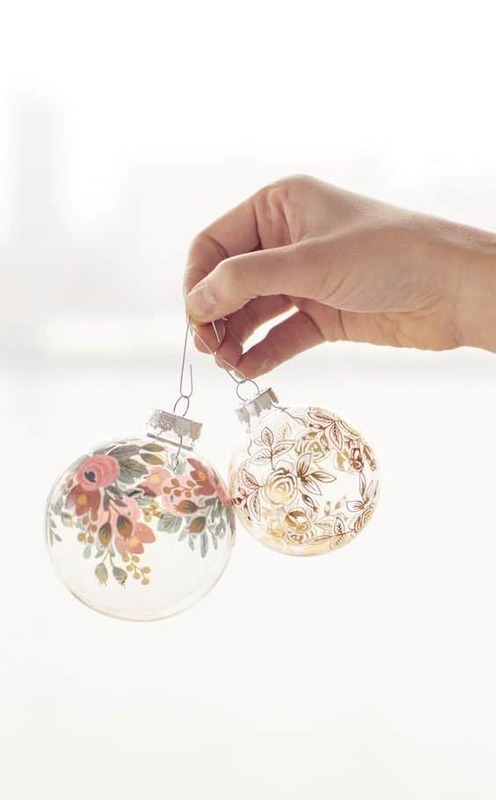 These Temporary Tattoo Christmas Ornament Crafts look absolutely divine. And how creative to make use of temporary tattoos for these?! The best part is that there are so many temporary tattoo designs out there that you’re sure to find ones that fit your theme best. Handmade Christmas Ornament Idea #10: These Easy Cinnamon Dough DIY Ornaments won’t just look cute on your Christmas tree, they will make your home smell amazing too. Absolutely perfect for Christmas! Handmade Christmas Ornament Idea #11: Aww, what an adorable ornament! 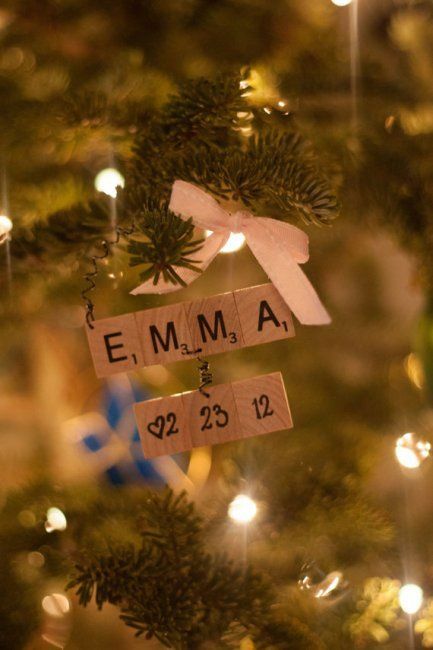 ThisDIY Baby’s First Christmas Ornament is a clever way to commemorate your child’s first Christmas. It’s a wonderful keepsake that your child will surely treasure when they grow up. Handmade Christmas Ornament Idea #12: Looking for ways on how to make homemade ornaments that will tickle your funny bone? 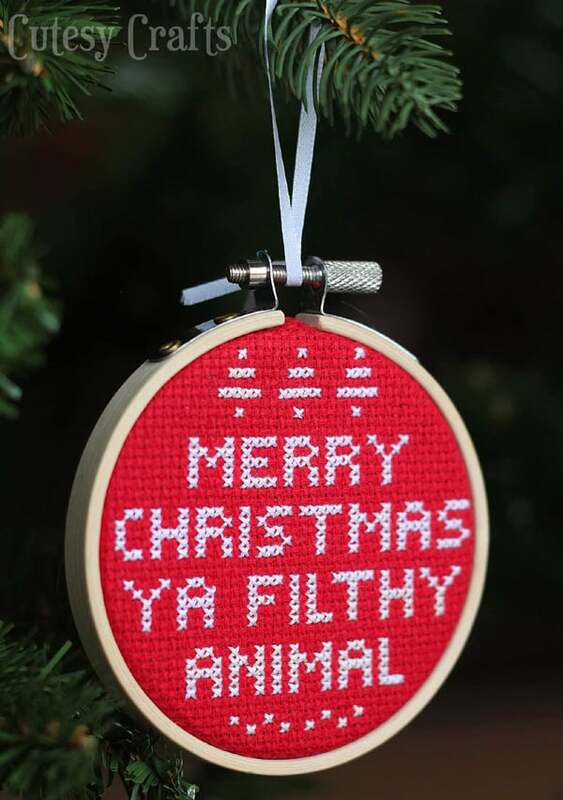 Check out this DIY Merry Christmas Ya Filthy Animal Ornament! You can use whatever funny phrases you can think of as well! Handmade Christmas Ornament Idea #13: The yummy ornament trend is definitely booming! 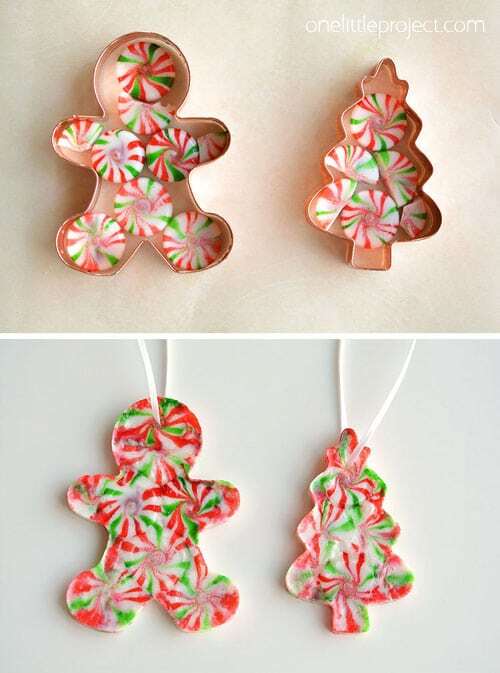 These Peppermint Candy DIY Christmas Ornaments are another example of ornaments that double as delicious treats. 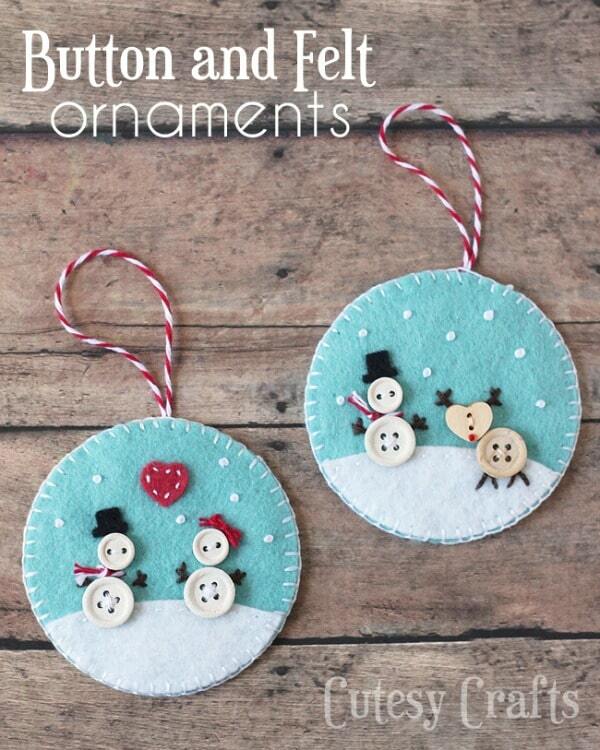 Handmade Christmas Ornament Idea #14: These Button and Felt DIY Ornamentsare so cute and whimsical! If you love making crafts, you probably already have scraps of felt and random buttons lying around, so this is a great way to make use of them!